Years passed and I wielded the crochet hook with moderate success, creating a couple of scarves, blankets and baby things along the way. The last time was over a decade ago, when I crocheted a scarf for a friend. I was looking to rekindle my love affair with the hook and was just waiting for that moment of inspiration (read – kick up the posterior) to get me started. 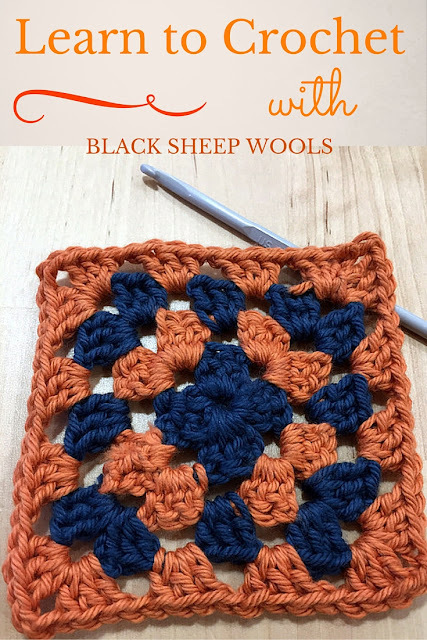 As luck would have it, I met the wonderful team at Black Sheep Wools at Blog On earlier this year. One thing led to another and I was invited to attend a Learn to Crochet workshop at their Craft Barn. This workshop is aimed at complete beginners and at those who, like me, are looking to refresh their crochet skills. The lovely Melanie, who is a Rowan instructor, was in charge of guiding us through our crochet manoeuvres for the day. We started with the basics. Melanie demonstrated how to hold the crochet hook and yarn and taught us a few basic crochet stitches. She explained how to read crochet patterns and the differences between British and American crochet terminology. Every time we learnt a new crochet skill, we had the opportunity to put it into practice. Melanie was on hand to help, to guide and to shout out encouragement. Before long, we had crocheted a long chain of stitches, a trendy bracelet and a pretty granny square. The crocheting was punctuated with hot drinks, a delicious lunch and the most scrumptious Victoria sponge cake I have ever tasted. Melanie was a very patient tutor, pitching the course at a level that we were all comfortable with. She was happy to share ideas and tips on creating marvellous things with crochet. The day was just the inspiration I was looking for to kick-start my crochet habit. Not content with the one colour of Rowan yarn I used in the workshop, I stocked up on hooks and yarn at the Craft Barn before heading home, my head brimming with beautiful crochet thoughts. I have since taken up a new crochet project. My son will be getting a crocheted scarf this Christmas, made entirely with love. And pretty sparkly blue. Disclosure: I was a invited to attend a Learn to Crochet workshop in exchange for this post. All opinions are my own. I can't crochet but I used to love knitting... scarves (never been able to knit anything else). Love the start of your scarf! Pinning now! Lucky going to the workshop. I love crochet, but like you learnt as a girl the basics (all I ever did was make long cables! ), and returned to it when my mum was in the hospice - she'd wanted to take her crochet in but couldn't work her left hand so I ended up doing it). 2 winters, I've started 2 crochet a longs, but never finish them because I never crochet past March. But this year I've not picked them up yet, so I think I need to sell on or pass on the yarn I have, and start my stripy blanket again with colours I prefer! That sounds amazing! Learning crochet with amazing cake... I need to sign up! I should really try again to learn. I never got passed doing a daisy! This sounds like a much more fun way than pausing you tube videos to keep up! I have never tried crochet before though my little girl is desperate to get all of the gear ... so perhaps a nice Christmas present, thank you for the inspiration.